East Bay Machine and Sheet Metal is the preferred source for industrial precision component manufacturing in the San Francisco Bay Area. East Bay Machine is using the latest technology to meet all your production needs! Throughout its years in business, East Bay Machine & Sheet Metal has embraced technology to ensure the highest possible standards, with particular attention to the precision engineering demands of modern industry. We have invested extensively in the latest technology, and are meeting our customers requirements effectively and efficiently, producing the finest quality products for a wide range of industrial and non industry uses. 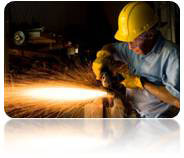 East Bay Machine & Sheet Metal services high technology, transportation, nuclear power, solar power, wind power, general industrial, and construction industries. The services we provide in each of these areas are dedicated to meeting our customers design, engineering, and delivery schedules. Our knowledge and expertise in these industries allows East Bay Machine & Sheet Metal to provide more extensive services under one roof than most of our competitors. Our products and services extend from machining to sheet metal fabrication, to welding of all types as well as structural steel fabrication and professional finishing. Our expert employees are ready to answer customer questions and collaborate in the development of component or product. East Bay Machine & Sheet Metal assumes full responsibility for the quality and precision of our products, achieving the best end result through the employment of quality concious employees. We inspect, review, analyze and record the whole process, from on-site visits of your facility to checking and documenting every feature, dimension and characteristic of the product we are contracted to manufacture.